Blackline Safety’s Loner Beacon: a lone worker safety device enabling users to locate remote employees where GPS signals are unavailable. Compatible with Blackline’s Loner safety monitoring devices, the Loner Beacon location beacons deliver precise positioning technology to locate employees indoors or, where GPS signals are unreliable or unavailable. The devices are easy-to-install, cost-effective, and intrinsically safe. In areas where GPS location data is unavailable, Loner devices can communicate an employee’s location based on signals from nearby Loner Beacons. If an employee suffers an injury or health condition, his or her Loner safety monitoring device communicates the alert type, employee’s name, and location to monitoring personnel who manage a pin-point emergency response to the correct building, floor, and room. Installation is easy, requiring just a few minutes to mount a bracket and click the Loner Beacon into place. Loner Beacons are self-powered by two C-cell alkaline batteries that provide five years of operation. Battery replacement is simple and cost effective. Loner Beacons are one of the most cost effective positioning technologies on the market. 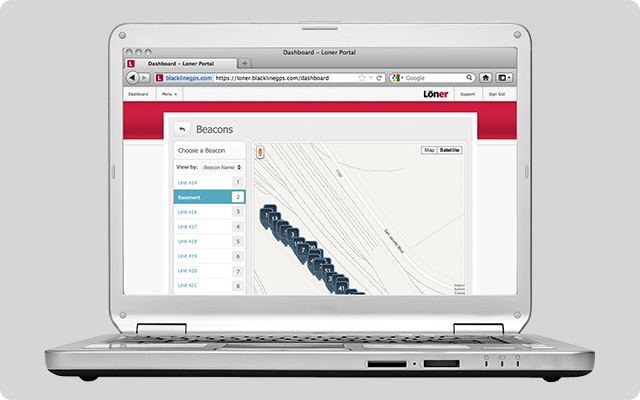 Beyond the low initial purchase, there are no ongoing services fees to operate Loner Beacons. Robust short-range signal that enables proximity detection to Blackline’s Loner safety monitoring devices. Does not require the installation care and calibration required of triangulation-based positioning technologies. Broadcasts a low-power signal for proximity detection by Loner devices. When in range of an Loner Beacon, a Loner device can report its precise location. Incorporates ANT wireless technology to ensure long battery life, robust communications, and high quality proximity detection. High performance communication; Short-range, tri-frequency radio communication with inference avoidance techniques. Two C-cell alkaline batteries; Battery life: 5 years continuous operation at highest power setting. Designed for industrial environments (indoors/outdoors). Designed to meet IP65 ingress protection against weather and dust. Battery powered (no wiring required). Removable mounting bracket that can be installed nearly anywhere in just a few minutes. Low-power continuous beacon signal enables Loner device proximity detection. Four configurable range levels between 4.5 m and 36 m (15 ft and 120 ft) line of sight (less range indoors or when obstructed). Single button for powering on/off plus configuration; Green LED for power indication and configuration; Red LED for low battery indication. ANT Wireless (2.4 GHz communication) to supported Blackline devices. Two C-cell alkaline batteries (included); Battery life: 5 years continuous operation at highest power setting; No wiring required. Storage temperature: -40° C to 65° C (-40° F to 149° F); Operating temperature: -20° C to 55° C (-4° F to 131° F); Ingress protection: designed to meet IP65 (dust-proof and high pressure water jets from all directions). FCC Part 15 Subpart B; FCC ID: W77BCN; Industry Canada 8255A-BCN. Loner Portal user account with activated compatible Loner products. One year limited factory warranty. Loner SMD, Loner IS, and Loner IS Arctic. Loner Beacons do not require an activated service plan to operate. Loner devices that operate with Loner do require an activated service plan. Loner location beacons may be used in any country.